Have you ever heard of a Gandhi museum, sough to be projected as the “largest” on the Mahatma, yet totally inaccessible, in sharp contrast to Ahmedabad’s humble, approachable and unassuming Gandhi Ashram on the banks of Sabarmati, set up by the Mahatma during the heydays of the freedom movement? It exists about 30 kilometres away, its idea was conceived by none other than a person who has today become even more inaccessible than he ever was: Narendra Modi, India's Prime Minister. 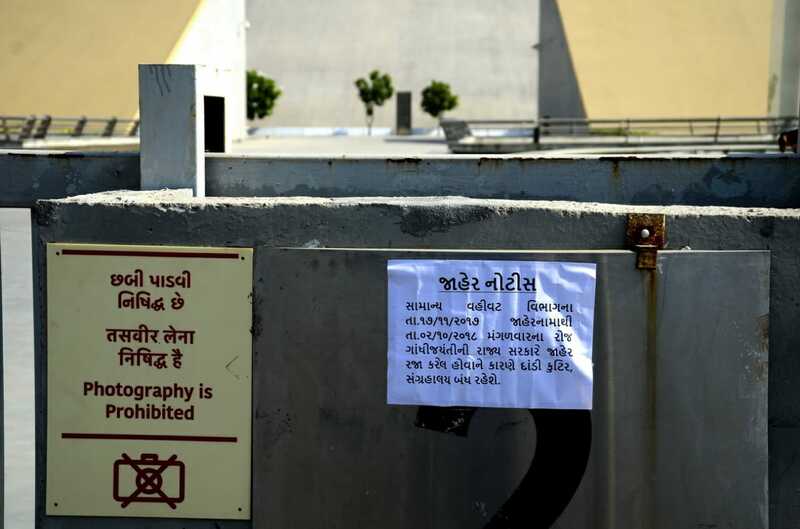 Visualized for an elite audience and set up in Gandhinagar, this museum, which was formally inaugurated by Modi in January 2015, is inaccessible to even residents of Gujarat's capital. Yet, it is called Dandi Kutir. Part of the sprawling Mahatma Mandir, where Modi has been interacting with India’s top tycoons every alternate year since 2011 through Vibrant Gujarat global summits, this so-called Kutir is anything but a cottage, symbolizing, if at all, Modi’s “vision” of the Mahatma. Officially projected as “India’s largest and only museum built on the life and teachings” of Gandhiji, unlike Sabarmati Ashram, where anybody can visit to learn from Gandhi’s humble life, this so-called cottage can be seen only through a guided tour which, if the official source is be believed, would begin only as and when a batch of 50 people are collected at an interval of 30 minutes, all them forming part of a tour guide. Unapproachable by any public transport, there have been cases when individual visitors, reaching the elite Kutir, had to return without gaining access to the museum after waiting for a couple of hours. Again, unlike Sabarmati Ashram, where the entry is free, this high-profile “cottage” charges Rs 10 per visitor from Indians and Rs 200 from foreigners. The contrast is indeed conspicuous. The Gandhi Ashram's managers, at least till now, have done all they can to ensure that its space is made available to the man on the street to learn from the life of the Mahatma. Lately, it has begun using high technology, but that too for making people directly access, through internet, all that Gandhiji stood for. In all about 25 lakh pages of life and work of Gandhiji and all those who came in contact with him have been digitized in a powerful Gandhi heritage portal. A project initiated by well-known Gandhi expert Tridip Suhrud, who worked as director of the Gandhi Ashram till last year, with this portal, any researcher or common Gandhi observer sitting anywhere in the world can access works by – and on – Gandhi. The Kutir, on the other hand, is located in a 41-metre high conical dome, claimed to be symbolizing a salt heap, seeking to represent Salt Satyagraha at Dandi, which took place on ground, next to the sea shore in Dandhi, South Gujarat. The closed door museum in a 10,700 sq metres is cement-concrete jungle, which again stands in sharp contrast to the historic Dandi Bridge, off Sabarmati Ashram, from where the Mahatma began his Dandi march in Ahmedabad. And what these “dilemmas, struggles and sacrifices”? 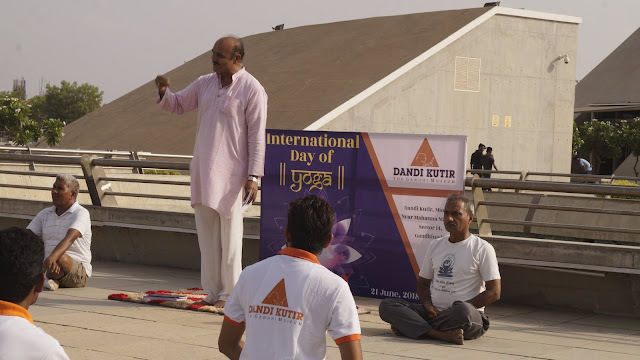 Introducing the Dandi Kutir, its official Facebook page says that the museum showcases Satyagraha, Sarvodaya and Swaraj – forgetting, perhaps deliberately, that the Mahatma used Satya and Ahimsa, or truth and non-violence, as the fundamental principles for an all-pervasive fight against a massive British empire, Hindu-Muslim divide, and the caste-ridden Indian society. One is left wondering: What does Modi, whose dubious role in 2002 riots is too well known, have in common with Ahimsa? As for his views on caste, in his now withdrawn book “Karmayog”, a collection of his speeches delivered to Gujarat babus, he said manual scavengers experienced “spiritual satisfaction” while doing the cleaning job! That the Kutir has nothing to emphasize on Gandhi’s emphasis on sarva dharma sambhav is not surprising. In fact, this reflects Modi’s mindset, which remains intact to this date. During an informal chat with a group of local scribes in Gandhinagar, Modi, firmly in the saddle after taking over reins of power in October 2001, when Gujarat riots hadn’t yet taken place, a discussion ensued on Hindu-Muslim relations. Seventeen years later, this segregation – an antidote of what all Gandhi stood for – has only further solidified. If it was confined to Ahmedabad till the 2002 riots, it has geographically spread to rural Gujarat. A case in point it the North Gujarat village of Sardarpura, where 33 persons were killed in 2002. It has left deep scars that haven’t yet been healed. If all Muslims living in the village were forced to flee, one smaller section, the relatively better off, has returned. The poor still live in a separate ghetto of riot victims, which has emerged post-riots, tens of kilometers away. Things are no different with many other parts of rural Gujarat, where the riots had broken out. Following indiscriminate lynching incidents, this poison of segregation is invading across India. 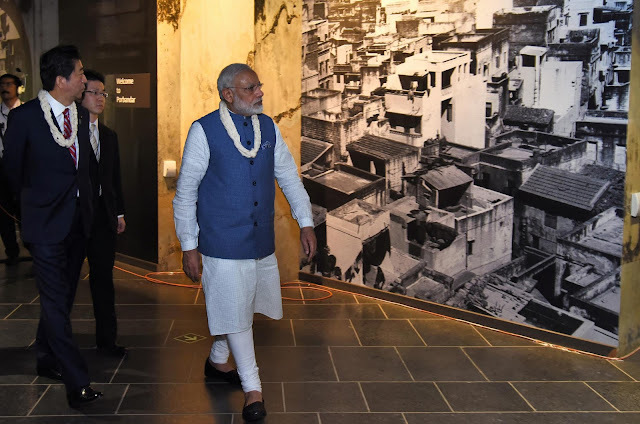 Meanwhile, keen visitors to Ahmedabad have lately noticed that, after he became Prime Minister, there have been efforts to “Modi-fy” the Sabarmati Ashram as well. An ashram insider ruefully pointed to this Counterview on how a plate saying Jawaharlal Nehru planted a now-grown-up tree, originally put on the main gate of the ashram, has been pushed to the corner, so that no one could see it any more. This insider, always in a simple khadi kurta pyjama, further takes objection to a Modi propaganda placard put up on the entrance of the museum block of the Gandhi Ashram – a huge Modi’s Swacchata Abhiyan poster. This is what a senior journalist, visiting Gandhi Ashram, noticed: On display in the ashram are expensive looking panels singing paeans to Modi in the guise of lavishing praise on his government’s trademark programmes which, according to him, have fetched little by way of positive result for the country. The professionally-mounted rare photographs on Gandhi’s life with appropriate annotations in a series of rooms leads one to an open verandah, where Modi panels are displayed. There is reason to wonder: Who allowed this? Is it an effort to send the message that the work being done by Modi is a natural extension of the Mahatma’s experiments with truth? 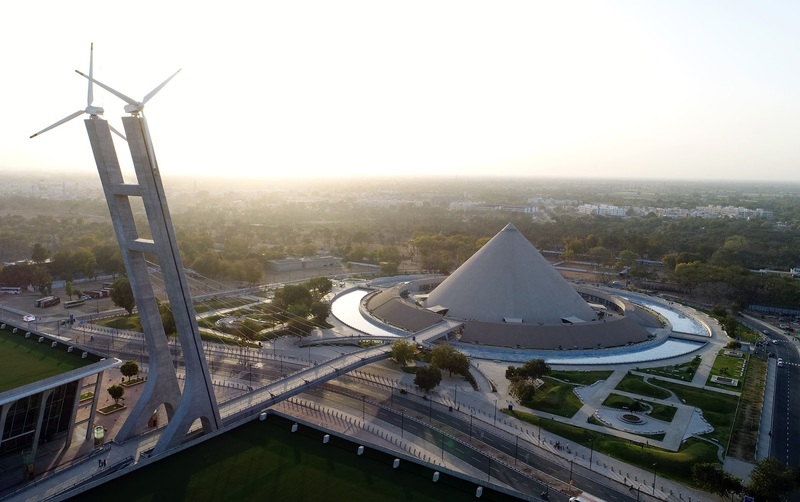 Senior photo journalist Kevin Antao, based in Gandhinagar, reports: When the nation was celebrating the 150 birthday of the Father of the Nation, the Dandi Kutir was officially closed to the general public. I had taken the photographs of the notice put up at the main entrance. I am attaching one of the photographs, published in the Times of India Ahmedabad. Secondly, at both the Ashrams of Gandhiji in Ahmedabad, people are allowed to photograph inside the ashram and even outside. Why are restrictions on photography placed at the Kutir? You have a lot of college students busy using their mobile phones to click stupid photos or selfies. It is a sickening scenario. Gandhiji is being used as a political crutch to achieve everyone knows what end.